If you are looking for quality cell phone tracking software on the market, mSpy may very well be the right option for you. As they have been devoted towards producing state-of-the-art software that covers all needs, the improvement in their initial product has been significant over the past few years as well. In addition, after the problems that have emerged with the use of StealthGenie, the need for a reliable alternative has multiplied. mSpy works on phones, tablets and desktops alike, meaning that you get great flexibility as to how you are going to use its service. Now, let’s have a look at what mSpy is all about at our detailed mSpy review! Keylogger: This feature of mSpy will allow you to keep track of all the texts that have been typed on your smartphone or your tablet. This will provide full control over anyone who has used your device without your consent, without a doubt. It is a great thing that you can check these texts remotely from Control Panel. mSpy without Jailbreaking: With the use of this new feature for iOS running devices (iPhones and iPads), you do not have to jailbreak your phone for getting the benefits of mSpy. With the alternative of iCloud backup service, you can get round the limitations that had been previously applied regarding the jailbreak process and still enjoy a fair share of mSpy features (like call logs, text messages, contacts, browser history, events and notes). Mobile Phone Tracking: You can find your precious device on the spot, with the use of its current GPS location. Find the whereabouts of your phone on a detailed map, check the history and have full control over the device from your Control Panel. Along with that, the feature of Geo-fencing allows you to build a virtual fence. Every time the device exceeds this fence, you will get a notification and thus have full control over the location of your phone and tablet. Parental Control: With mSpy, you will feel relieved when it comes to parental control. There is the option of filtering online content and blocking specific websites that you feel are not suitable for your children to access. Furthermore, you can set time limits and hours of the day when access to several sites is restricted, forbidden or allowed. You can also block applications and their installation, which can be proven truly handy. Last but not least, you can restrict incoming calls and therefore you can control the people who contact your kids – with the management of such restrictions taking place from your Control Panel. SMS Tracking: You can find out a lot about SMS, both incoming and outgoing, with the contribution of mSpy. Learn who sent the message or who received it, find out the content of each SMS, the time and date when the SMS has been sent or received. Call History: Not only will you be able to keep track of the incoming and outgoing calls, but you will also have the opportunity to see how much each call has lasted. Have full power over the total calls that have been made, as well as the numbers of these calls and the names of the callers (assuming that they are listed on your phone). View Photos and Videos: There is great versatility in mSpy phone monitoring software regarding photos and videos. You can see when each photo or video has been captured and access them remotely from your Control Panel. You can have a look at these photos and videos as thumbnails, for your best convenience. App Blocking: There is nothing you cannot do with mSpy, as afar as app blocking is concerned. You can have access over the apps that will be installed or used by your kids or people at the office. They are both dangerous phenomena (kids’ unauthorized access and harmful apps to the business) and mSpy offers full control to you. Android and iPhone Tracking: The software is fully compatible with Android 4+ and iOS 6 – 8.3. Snapchat Tracking: With the restriction of having already downloaded and installed Snapchat on a specific device, you can access all the data from a Snapchat account and with the remote access of Control Panel, you can access the data anytime – not just for a specified time period. WhatsApp Tracking: Like many other communication platforms, WhatsApp tracking is made real with the top spy software named mSpy. You can view all the chats that have been made using WhatsApp and control all your communication, promptly and effectively. Viber Tracking: This is another cool feature of mSpy, enabling you to access Viber and view all the communications and the free calls or messages that you get or send. Skype Tracking: Track Skype calls, read the chats that have been made via Skype and have all the information that you require straight from your Control Panel. Facebook Tracking: In a similar manner, you can gain full access to Facebook chats and all other information. Line Tracking: With line tracking, you can have full control over all the chats and the platforms. In this way, you make the most out of finding out who sent what and when. This is pretty handy, assuming that you can read and see what your kids or anyone else send and receive. Management Features: You can set the reporting of everything remotely to you, either by Wi-Fi or by any connection whatsoever or adjust the settings to your convenience. This can eliminate all threats of data sent without any authorization. Security Features: From your Control Panel, there are several security features available: you can lock the phone or wipe the data, obtain sim change notification, start, pause or delete the application. mSpy with Jailbreak: In order for you to benefit from mSpy in a jailbroken device, there are several requirements that need to be met. The supported iOS extends from iOS 6 to 8.3. Your iPhone or iPad must be connected to the Internet, while you have to access the device physically for installing mSpy. The best thing about this option is the fact that you get all the features of mSpy, unlike the alternative that does not call for jailbreaking. mSpy without Jailbreak: mSpy without jailbreaking is a relatively different approach. Of course, it is a great thing that it is compatible with all iOS versions. The device must be Internet-enabled. However, you do not require any physical access to the device, assuming that you have got its iCloud credentials. If iCloud backup is not activated on the device, though, you may need physical access. In this scenario, you only get limited features (Contacts, Call Logs, Text Messages, Browser History, Events, Notes, Skype, Wi-Fi Networks and Whatsapp). mSpy for Computers: On top of the significantly thorough compatibility offered by mSpy to a number of popular mobile phones and tablets, there is mSpy for computers that covers the needs of both Windows and Mac OS users. Offering a wide range of features, mSpy for computers satisfies the needs of Mac OS 10.7 – 10.10.3 and Windows XP x32, Windows Vista x32 and x64, Windows 7 x32 and x64, Windows 8 and 8.1 (without Metro apps). Next in our Mspy review, we have to outline the different pricing options that are offered. Well, there are different plans covering phones, desktop demands and bundle plans that work with both. In regards to phones and mobile devices, there are three plans that you can choose from: the Basic plan (1 month $29.99, 3 month $59.99, 12 months $99.99), the Premium plan (1 month $69.99, 3 month $119.99, 12 months $199.99) and the Family Kit plan for 5 subscriptions (6 month $599.95 and 12 month $799.95). As you can imagine, there are differences when it comes to using special features. This is what makes them different in the price, too. 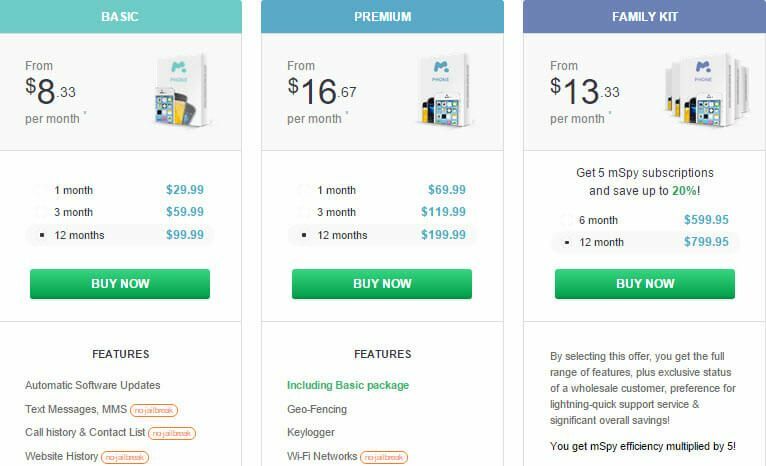 Desktop users get the chance to select between the Basic plan (1 month $29.99, 3 months $39.99 and 12 months $69.99) and the Family Kit (6 month $199.95 and 12 month $279.95). Finally, the Bundle Kit is offered at $84.99 for a whole month, $135.99 for three months and $229.99 annually. So, a lot of options are out there, requiring your attention and detailed analysis prior to making your final decision. Moving forward, the payment methods for mSpy will certainly delight anyone. There is the option of paying with the use of PayPal, as much as using Visa, Master Card, American Express, Discover, Bank Wire Transfer, Direct Debit. The only thing that is missing is Bitcoins, which we believe they need to add soon. Once you have completed your signup process and after having finished with the payment, you will need to setup and install mSpy on your device. The whole procedure is really fast and does not take more than a quarter of an hour to complete. Apparently, for the first time you need to have physical access to the mobile device. After that, you can remotely check it out and monitor every single detail. First and foremost, you will be given a confirmation email from mSpy (at the email address that you have written down during the signup process). Inside this email, you will find a link that will direct you to the Control Panel that will basically be your way of monitoring everything. There, you will need to login and comply with the detailed instructions that follow. Once you are done, you will be ready to start monitoring whatever you like! As you can tell, the installation is ideal for novices – tech savvies will not be disappointed, either! There are times when you wish you had a sixth sense or the ability of listening to others talking when you are not around. Even though you are not a superhero, there is the opportunity for you to take advantage of the magical features that mSpy offers. Whether you are suspecting your husband or wife of cheating, whether you want to make sure that you are getting the right info and not lies or you wish to get evidence, mSpy can help you out to monitor your kids, employees or catch a cheating spouse. As we have disclosed earlier, there is no difficulty in downloading and installing mSpy. So, what does it take before you actually start benefiting from its features like a pro to be thoroughly specific? You simply get your hands on the specific device that you wish to spy on for a few minutes. You complete the downloading process. You access the Control Panel remotely on your own device and start checking out what you have been dying to see. What will you be able to gather as info from this app? The GPS location of the person you are interested in. The SMS sent and received. The call logs of both incoming and outgoing conversations. Emails and other communication sent via IM apps (Whatsapp, Viber, Facebook, Skype). URL tracking that leads to suspicious websites (for instance dating sites). There is a lot for you to get your hands on, so this is a really cool app for identifying whether you are being dodged or not! Any Special Things to Highlight? Yes, there are several things that strike as exceptional in mSpy! Firstly, we have to mention the demo site that has been created on the mSpy website. There, you can have a look at the various features and how they work. Then, there is always a safety net that enables you to back off from the deal and cancel the subscription without any charge. With the ten-day full money refund guarantee, you eliminate any risk and you complete the subscription without thinking twice. Last but not least, you can call a representative of mSpy 24 hours a day, seven days a week. Besides all other alternatives for contacting mSpy, the direct nature of calling and having an experienced professional on alert to meet your demands is always a great thing to consider! MTechnology Ltd is the company behind mSpy. They run offices in both the United States and the United Kingdom, which adds to their solid reputation. MTechnology Ltd is a reliable company that has been offering mSpy for some years now with great success. With the safety precautions of the ten-day full money refund guarantee and with the wide array of special features that complete a strong plan, mSpy does its trick and reassures everybody about the solid nature of what they offer. Conclusion – is it the right spying software for me? Well, now that we have completed our mSpy detailed review, let’s wrap it up and see whether or not we refer to the best cell phone spyware in the market today. First of all, we have to admit that mSpy provides software both for phones – tablets and computers. There are numerous superb features, such as Geo-fencing and keylogger, device wipe out and lock, comprehensive reports and text monitoring, chat reports and blocks of applications and functions. All these features, alongside the premium tech support and the safety net of the ten-day full money refund guarantee, make the most out of mSpy tracking and monitoring software. If you are in search of something qualitative and effective as tracking and monitoring software to mobile phones, tablets and even desktops, mSpy may well be a solid solution. But yes, some users might want to pay via Bitcoins and that’s not a possibility as of now with this spy tool provider – so might not be good for those.